Updated at 7:59 a.m. EDT. Some kind of record is being set with the scheduled confirmation hearing next Tuesday for Bernard McNamee to fill the open seat on the Federal Energy Regulatory Commission. It will be less than two weeks between the day McNamee was nominated by President Trump and when he sits before senators to answer questions about a number of topics, not the least of which will be his views on subsidies for failing coal and nuclear plants (Energywire, Oct. 4). "In my experience, that is light speed for the nomination of a FERC commissioner; can't think of one that moved anywhere near this fast," said Jeffery Dennis, general counsel for Advanced Energy Economy. "I'd call this unprecedented when FERC has four sitting commissioners and no expected vacancy for over a year," Dennis said. The schedule could be part of the larger goal of Senate Majority Leader Mitch McConnell (R-Ky.) to move as many Trump nominees through the confirmation process before the November midterm elections in case Democrats were to seize control on Election Day. Sen. Lisa Murkowski (R-Alaska), chairwoman of the Senate Energy and Natural Resources Committee, said, "If you're sitting on the FERC with an empty spot, it can't come fast enough." It is unclear how soon after the hearing that Murkowski would schedule a committee vote on the nomination. As to Senate floor action, that is up to McConnell. Addressing McNamee's role in the Department of Energy's efforts to explore subsidies for coal and nuclear plants, Murkowski said, "I think we need to remember he's coming from the department but he's moving to a different agency, so you've got basically different hats." In the past, the fastest Senate action on a FERC nominee was 35 days in 2006, when Marc Spitzer, a Republican member of the Arizona Corporation Commission, was nominated by President George W. Bush. It normally takes two to 10 months for the Senate to hear from a nominee after being named by the president. McNamee, 51, has been executive director of DOE's Office of Policy since June. He previously served at DOE from May 2017 to February 2018 as a political appointee in the general counsel's office. 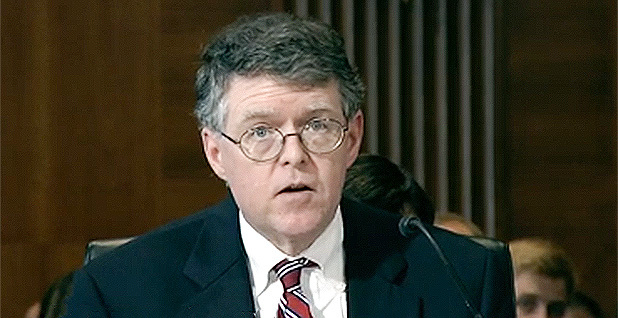 Between those stints at DOE, McNamee was a director at the Texas Public Policy Foundation, a conservative think tank. FERC currently has four commissioners, two Republicans in Chairman Kevin McIntyre and Neil Chatterjee, and two Democrats in Cheryl LaFleur and Richard Glick. One reason that the Senate could move so quickly on McNamee is that he went through background checks when he was named deputy general counsel for energy policy at DOE in May of 2017. The position is politically appointed but not Senate-confirmed. The DOE job would have included a White House interview and background check and a likely FBI security clearance process because of the types of issues that could come before someone in the DOE policy job, said a person familiar with the process. McNamee also at the time filled out his required financial disclosure report for that position. Should McNamee be confirmed, it would be the first time since October 1990 that no member of the commission had experience as a state regulator. That was the year that Branko Terzic joined FERC after serving on the Wisconsin Public Service Commission. Rob Powelson, who resigned from FERC in August, had been chairman of the Pennsylvania Public Utility Commission, and as recently as 2017 he was president of the National Association of Regulatory Utility Commissioners. Greg White, NARUC's executive director, said recently he is "concerned that we may for the first time in many years not have somebody with that state perspective," noting that 13 of the past 23 FERC appointees came from state commissions. A Washington attorney who formerly worked at FERC questioned the Senate's speed. "What's odd about this is not only the short amount of time between the announcement of the intent to nominate and actual hearing, but the fact that it's occurring at a time when the Senate is pretty bogged down with a lot of stuff. ... There are four sitting commissioners — there is no outward urgency really," the attorney said. "It just feels like the most urgent piece of this is political — that [the commission] expects to make a decision or will want to make a decision that will divide the commissioners in a partisan way," he said. Industries that rely on FERC are right to be concerned, he said. "Even though you might be on the right side of the political divide right now, a politicized FERC is not really good for anybody."